Each ticket entitles entry to one child & one accompanying adult. 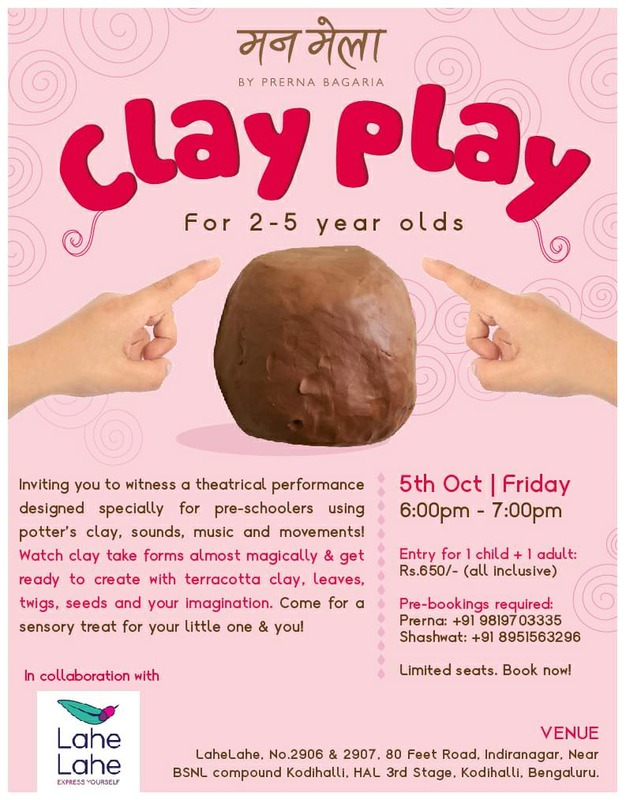 Clay Play Workshop is a theatrical performance designed specially for preschoolers. The performance begins with a Material Theatre Performance by Prerna Bagaria – a mono act using music, sounds, movement and clay! Children are then encouraged to join the play to project their own thoughts and ideas. Explore the different possibilities with clay and create gorgeous pieces that they can take home! Prerna is a Communication designer who loves being with children. Prerna draws inspiration & energy from various forms of art & as much from daily life. She has over 8 years of experience with children’s projects like Book design, Toy Design, Performance, Films & Curriculum design for pre-schools. Prerna was introduced into the art of Material Theatre by Barbara Kölling of Helios Theatre, Germany. Prior registration is mandatory. Contact Prerna or Ghanvi to book your tickets.